* note * Comissions are now closed. This is a guy I drew 90% of a few months ago, but never finished, so he didn't make it into the sketchbook. I finished him this morning, and colored him while my students were taking a school survey, and here he is. He was a study for one of a trio of expatriate White Russian mercenaries who have since been edited out of the story for Crogan's Escape. 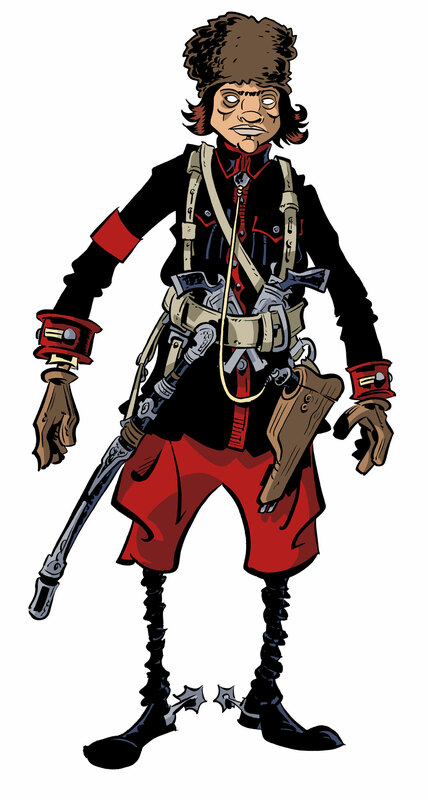 That armband would display a Warlord's emblem, but I haven't designed it yet. Sculpted one of the Crogan brothers from Crogan's Loyalty as a demo in maquette-building for one of my character design classes. Teaching the students how to build maquettes is not something on which an inordinate amount of time should be spent; it's helpful to wrap one's head about the three dimensionality of a design, and representational sculpting will DEFINITELY improve your drawing, just by making you address how one part influences another. 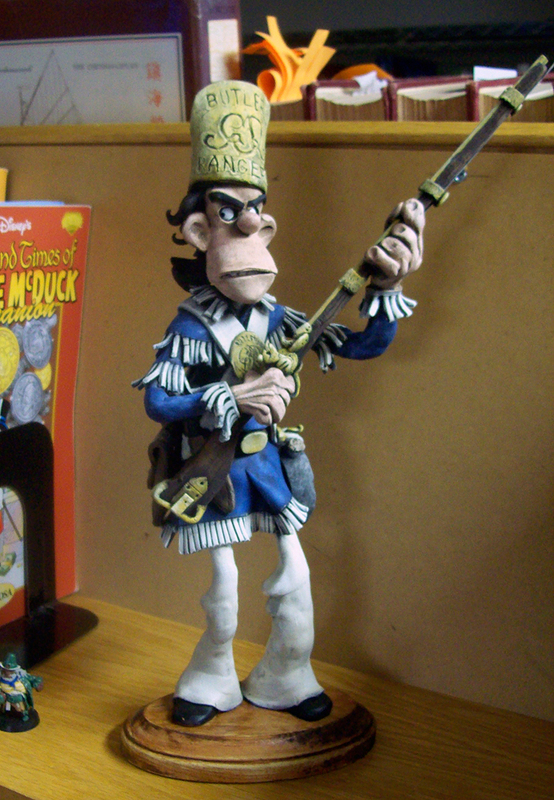 But I've known a few people who have fallen into the cyclical pit of feeling like they need to make a maquette for every character that they do, and never get any pages done. So what's even the point? We're not maquettists, guys, we're storytellers. I spend a LOT of time on preproduction, but it's a means to an end. Never, ever, ever let it be the end. It's self-indulgent, and benefits you nothing. ALWAYS make sure your concept work is leading to stories. Otherwise you're just playing with yourself. This week's Silhouette Sundays piece is a few of the characters from H. Rider Haggard's King Solomon's Mines, which I've mentioned is a project I'd like to adapt. 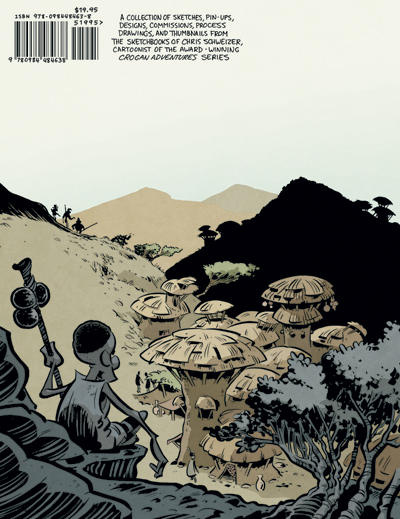 Also, I was the guest columnist for Comic Book Recourses/Robot 6's "What Are You Reading?" feature this week. The sketchbook files are all finally done! I have to put them in order with the proper amount of space for spine allowances, but hey, the hard part's finished! It goes to press on Wednesday, I think. My colleague and all-around amazing artist Nolan Woodard colored the covers, and got 'em back to me, despite the fact that I just gave him the files and he's in the middle of a move into a new house with his pregnant wife. 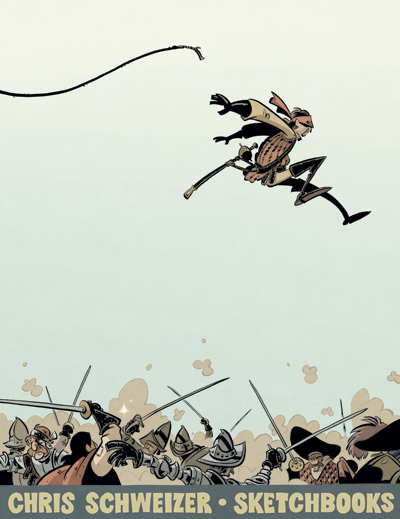 He's a great colorist - works regularly for Boom, does stuff for Marvel... he's also a great comic artist, doing Star Wars cards for Topps as well as commissions when time allows. Check him out! I'll be making the book for sale through Amazon and, hopefully, Diamond. Some details: 184 page softcover, $19.95, 8.5"x11." Now, here's a special deal for any paid Crogan Adventure Society agents (limited to those who purchased their membership before April of 2011): If you are going to HeroesCon, you can pick up the book from me directly. Show me your membership card, and you get the book for FIVE DOLLARS. That's a seventy-five percent discount. See? I told you there'd be perks! If you're an agent but can't make it to Heroes, I'll be sending out copies around the same weekend, also signed, for TEN DOLLARS. You'll pay no shipping (that's where the price discrepancy comes in) if you live in the states; international may require additional shipping. I hope you'll consider the discount a thanks for supporting the Crogan Adventures through your membership. For everyone else, the book will be available at the regular $19.95 price - around the price you'll pay for most sketchbooks, but much, much longer than the average, I'd reckon. Maybe not as good, but bigger. More details to come. I should've gone to bed three hours ago. Maybe I'll pull an all-nighter. Woof. 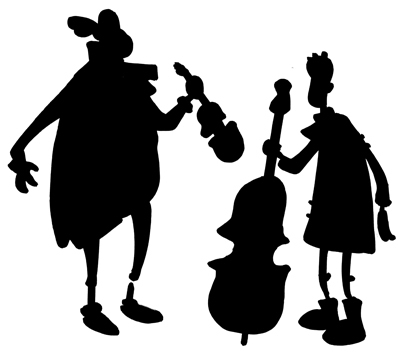 Just to make sure I keep up with posting, I thought I'd start a new thing - Silhouette Sundays (it was gonna be Saturdays, but I forgot yesterday). 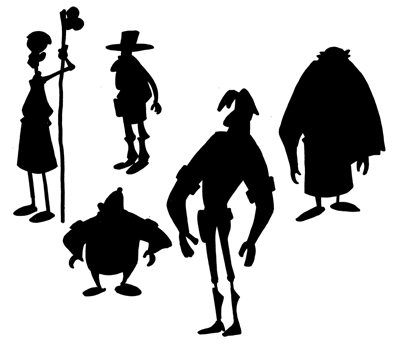 Each Sunday I'll post some silhouettes of how I'd tackle various characters. Most will probably come from books, but who knows? This week: Jack Aubrey and Stephen Maturin from Patrick O'Brian's naval series. I only just read the first of these books (there are 20, 21 if you include the unfinished final tome), and have started the second. They're just as good as everyone says. I made sure to give Stephen clunky, lead-lined boots. In response to Marvel's announcement that they'd be changing Black Panther to "American Panther," a bunch of my students did their versions of various heroes and villains, replacing a color in their name with "American." 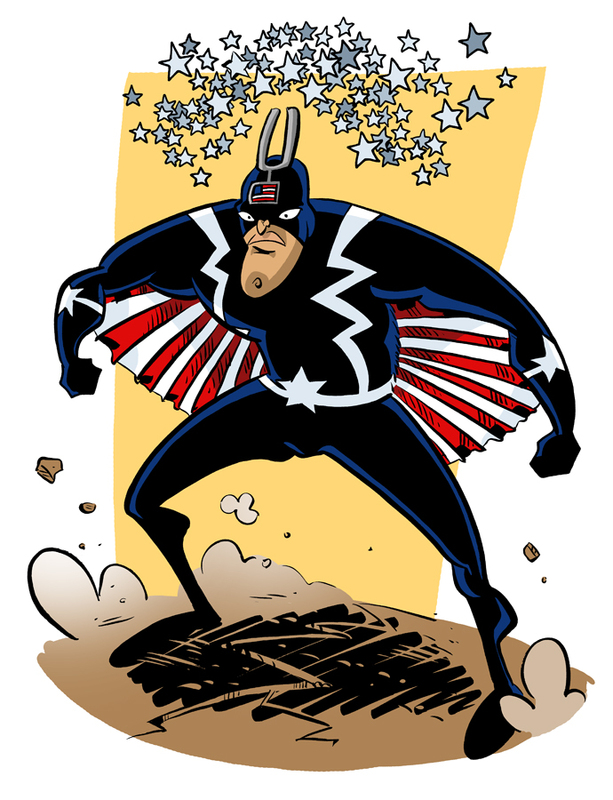 I did Black Bolt (pictured above) as American Bolt. Note the Kirby dots replaced with stars, USA! USA! Anyway, check out the whole collection - there are like twenty, and it'll give you a peak at some students who are going to blow your mind in the next few years. I did the pencils, digitally, for the back cover illustration for the sketchbook. Though not a scene from it, it incorporates some design elements for a kind of adaptation/reinterpretation I've been working on for H. Rider Haggard's King Solomon's Mines. I still have to letter the vast majority of pages for the sketchbook - I'm doing the text by hand - and juggling it, my school prep, teaching, and getting enough time with Liz and Penny has been a trudging process. Liz is going to visit my sister for a couple of days, though, so I'm gonna buckle down, work round the clock (when I'm not teaching, and I've already done next week's prep in advance), and see if I can knock most of it out. 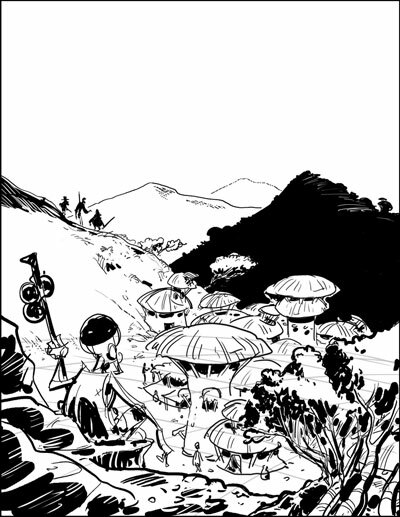 I have to have the files off to the printer by April 17th in order to make sure I have the book well in time for HeroesCon.